Cocktail fads come and go, but few have experienced a demise as rapid as tiki cocktails. Popular during the 30s and 40s in America, tiki bars in all their kitschy glory spearheaded the blueprint of modern bartending with spirit-forward drinks like the Zombie and the Mai Tai. After the 60s, however, the spotlight dimmed as these fruity drinks slowly devolved into candied boozy bombs with little finesse. 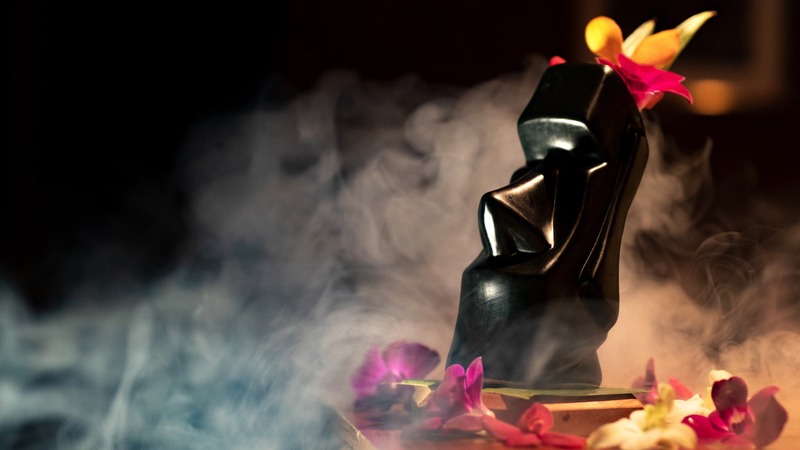 Many slighted cocktail movements make an eventual return, and in Singapore, tiki cocktails are once again seeing the light at the hands of the team behind Junior The Pocket Bar along Tanjong Pagar. Tucked away in an alley, the 10-seater address is known for its rotating concepts. Every six months, the menu and décor changes in totality to reflect its theme. 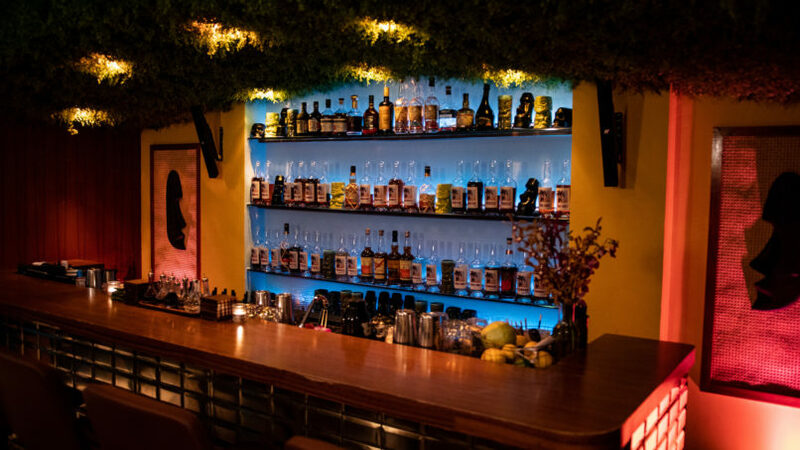 We’ve been through Noma, the bar’s jaunt through agave spirits, and Magnolia, its renaissance of New Orleans’ classic cocktails, and now we’ve arrived at Pacifica, Junior’s homage to tiki cocktails, Polynesian flavours and everything in-between. Bartending duo Peter Chua and Joe Alessandroni both believe Singapore is ripe for a tiki concept bar, given our easy access to the fresh tropical fruits that are the backbone of this cocktail style. With this advantage, the two have resuscitated inventions from pioneering tiki bars like Don the Beachcomber and Trader Vic’s, alongside their own takes on tiki cocktails for their 27 drinks-strong menu. Anyone’s experience of such a concept must begin with the Zombie, a legendary libation created by Donn Beach in his namesake bar in California. There’s no holding back the spirits that go into a Zombie. Typically made with three types of rum, falernum, and absinthe the drink is rounded out with fruit juice (typically grapefruit and lime), bitters and spices. Junior keeps to Don the Beachcomber original, except swapping out golden rum for its syrupy, darker cousins, delivering a tropical punch that goes down dangerously easy. Return of Jiang Shi is the house take on the Zombie. Toying with how the culinary aspect of tiki bar culture largely riffs on Cantonese cuisine, this drink nods to the comical vampires found in B-grade Chinese horror films. 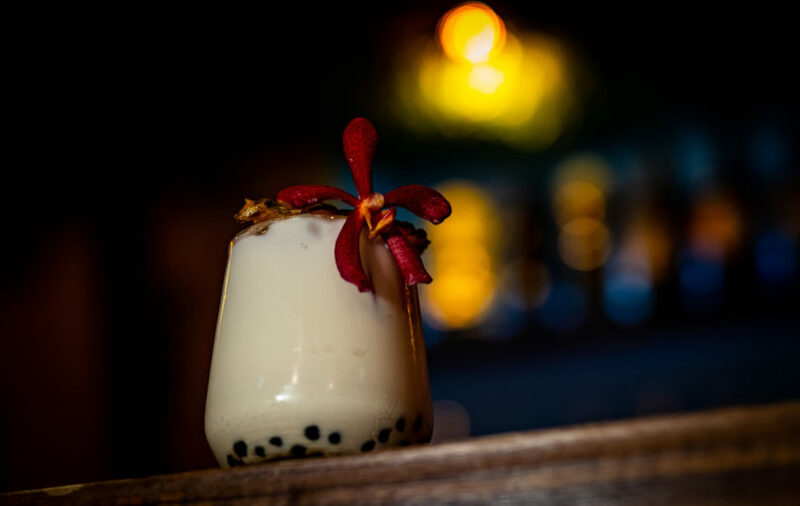 Keeping with the tiki DNA that Alessandroni terms “big booze, fruity flavours and spice”, Return of Jiangshi is a slightly savoury approach to the drink, with Chinese mushroom-infused rye and smoky mezcal as the base. Beetroot and five spice provide an earthy layer that is relieved by passionfruit and lemon. 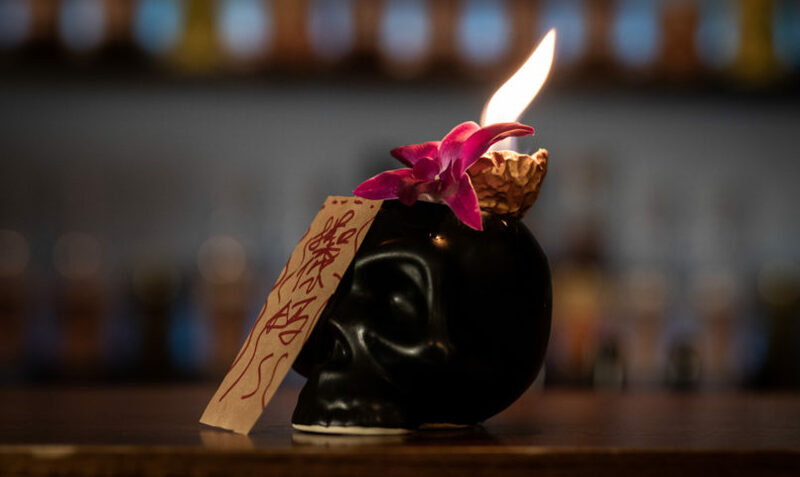 Beyond flavour, the presentation for this drink scores an A as well — poured into a black skull plastered with a talisman, the paper is lit on fire before you drink it. Do us a favour and ask the bartender what’s inscribed on the talisman. It’ll bring you good luck. Lesser-known drinks from the tiki canon are also on the menu. There is the Saturn, a gin-based drink concocted by J. Popo Galsini who won an international award for the drink in 1967. The gin is shaken with passionfruit, lemon and falernum, and sweetened with a mixed nut orgeat that gives the overall cocktail a distinctly nutty note that mingles with the citrus. Closing off the concept is the reworked food menu filled with snacks familiar to most Asian diners. 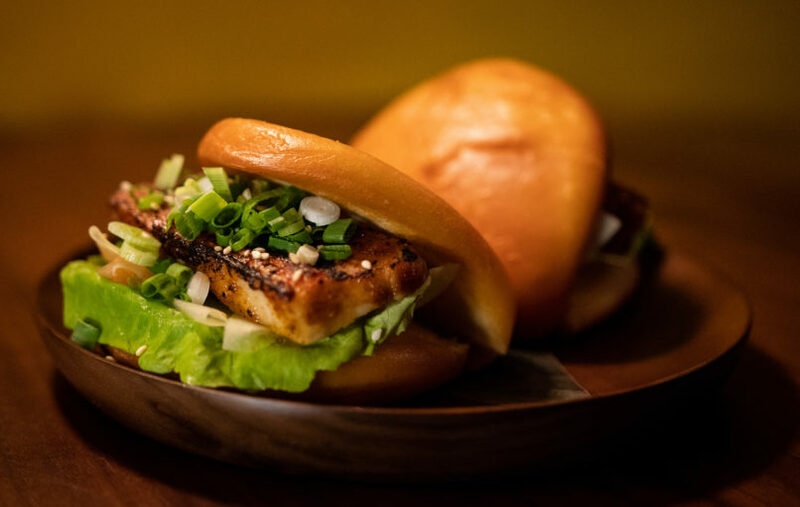 Spicy grilled pineapple slices served with blistered Padron peppers make for good bites to cut the fruitiness of the drinks, but for something more substantial, give the Yin & Yang pork belly sandwiches a run. Nestled in deep-fried mantous glazed in a pineapple gouchujang, this spicy, sweet and fatty bun hits all the spots. “Tiki is a mood and a feeling,” said Alessandroni. The genre is meant to be fun, indulging in the playfulness and escapism that spurred the tiki bar movement in the first place. With Pacifica, guests can experience a slice of paradise past and gain a newfound appreciation for cocktail history that they might not have known before. Just be sure to not order one too many Zombies.